This tutorial covers Developing Procedures and Functions, Creating a Procedure, Executing a Procedure, Creating a Function, Executing a Function, Passing Parameters – IN Parameters, OUT Parameters, IN OUT Parameters, Purity of a User-Defined Function and Positional and Named Notations. A subprogram is a named block of PL/SQL. There are two types of subprograms in PL/SQL namely Procedures and Functions. Every subprogram will have a declarative part, an executable part or body, and an exception handling part, which is optional. Declarative part contains variable declarations. Body of a subprogram contains executable statements of SQL and PL/SQL. Statements to handle exceptions are written in exception part. When client executes a procedure are function, the processing is done in the server. This reduces network traffic. The subprograms are compiled and stored in the Oracle database as stored programs and can be invoked whenever required. As they are stored in compiled form when called they only need to be executed. Hence they save time needed for compilation. They allow you to break the program into manageable modules. They provide reusability and maintainability for the code. Procedure is a subprogram used to perform a specific action. A procedure contains two parts specification and the body. Procedure specification begins with CREATE and ends with procedure name or parameters list. Procedures that do not take parameters are written without a parenthesis. The body of the procedure starts after the keyword IS or AS and ends with keyword END. In the above given syntax things enclosed in between angular brackets (“< > “) are user defined and those enclosed in square brackets (“[ ]”) are optional. OR REPLACE is used to overwrite the procedure with the same name if there is any. PRAGMA AUTONOMOUS_TRANSACTION is used to instruct the compiler to treat the procedure as autonomous. i.e. commit or rollback the changes made by the procedure. Parameters are used to pass the values to the procedure being called. There are 3 modes to be used with parameters based on their usage. IN, OUT, and IN OUT. IN mode parameter used to pass the values to the called procedure. Inside the program IN parameter acts like a constant. i.e it cannot be modified. OUT mode parameter allows you to return the value from the procedure. Inside Procedure the OUT parameter acts like an uninitialized variable. Therefore its value cannot be assigned to another variable. IN OUT mode parameter allows you to both pass to and return values from the subprogram. Default mode of an argument is IN. A procedure can be communicated by passing parameters to it. The parameters passed to a procedure may follow either positional notation or named notation. 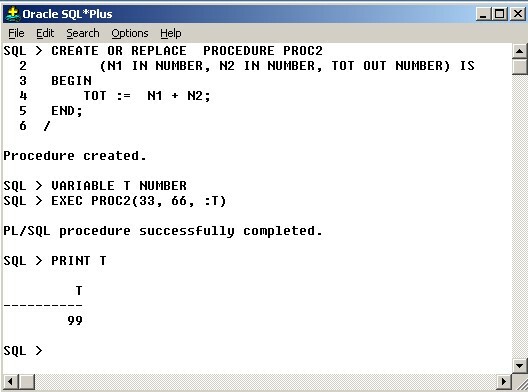 A procedure can also be executed by invoking it as an executable statement as shown below. 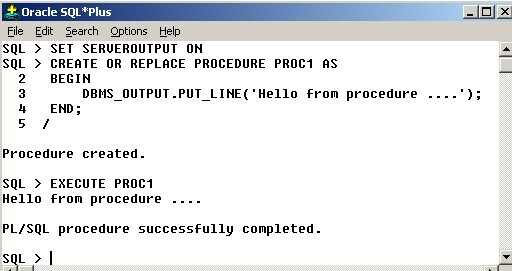 PROC1; — PROC1 is name of the procedure. 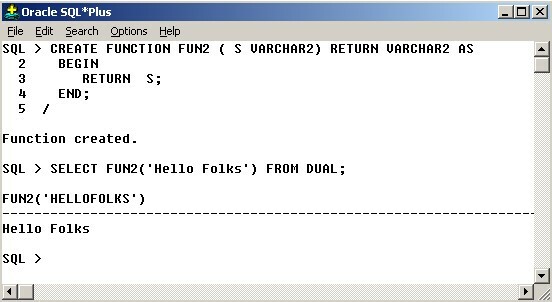 A function is a PL/SQL subprogram, which is used to compute a value. 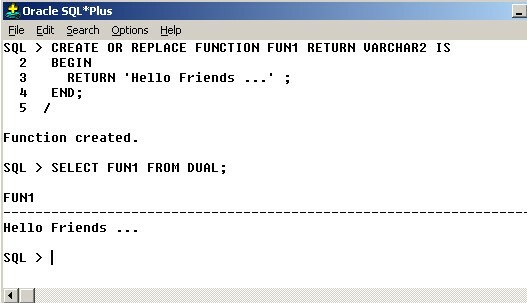 Function is same like a procedure except for the difference that it have RETURN clause. Function with arguments. Different ways of executing the function. Lists all the procedures, functions in current user. Lists all the procedures, functions in all users. Drops or Removes a procedure from database. Drops or Removes a function from database.